Yum! 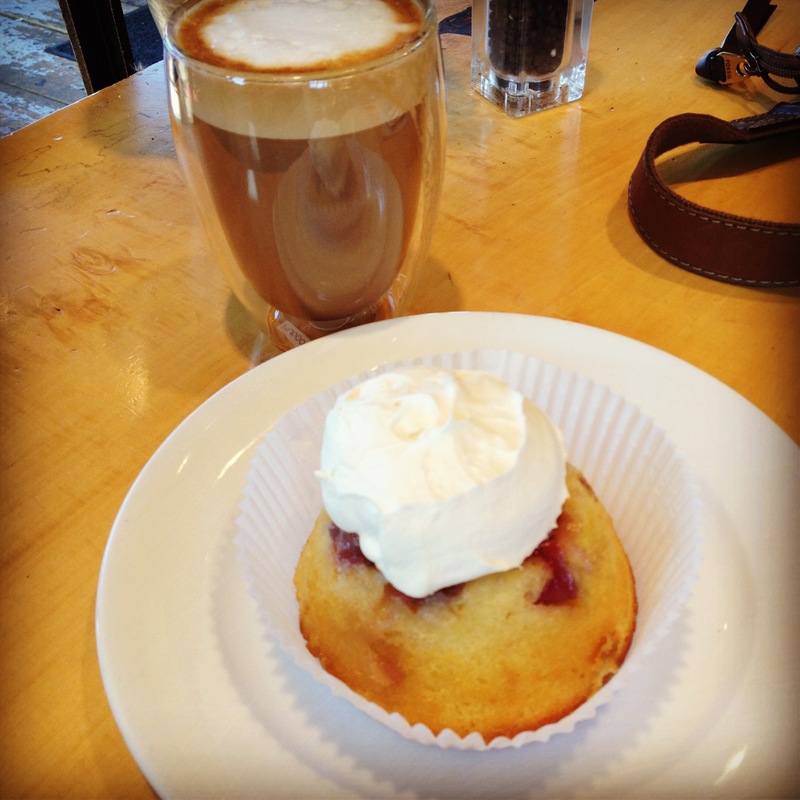 Kitchen and Bakery is a bustling upscale casual cafe located in St. Louis Park, close to Lake Calhoun. In keeping to their tradition of fresh and exciting options, the menu changes twice a month and offers ingredients that are seasonal. Along with a full menu for breakfast, lunch and dinner, Yum! has an incredible bakery that compliments their specialty coffee drinks. This is one gem you do not want to pass up. Thanks to the folks at LoriFinkProductions, you can watch their video that will show you a little bit more about Yum!’s owner and see many of their delightful dishes. YouTube: Click here to watch it now! When my fiance and I were looking for apartments in the twin cities metro area, I couldn’t help loving the idea of living close to this cafe! Yum! has quickly become one of my favorite places. It’s my go-to for a well-crafted coffee to start my morning…or any other time of the day. Also, given to ever changing menu, it keeps me coming back for more! On top of the menu, their service is top-notch as well. They are always friendly and offer great suggestions for when you cannot decide what to order. Plus, the wait for your order isn’t long. Now, enough gushing about how much I love this place, lets get to the main dish! For starters, I had to try their specialty coffee. Above is a caramel mocha latte brewed to perfection. While it was too sweet for my taste (I always like my coffee a little more on the bitter side), I was still in caramel mocha heaven. I recommended it to one of my best friends living in the area as well, and she absolutely adored it — she prefers her coffee on the sweeter side. If you’re like me however and prefer something a little bitter, talk to the baristas. They recommended that I try a simple caramel latte. That did the trick! I’ve been hooked ever since. As for the rhubarb upside down cake, it was a pastry dream. Super moist and not incredibly sweet. The white fluff on top is a generous serving of whipped cream that complements the tart of the rhubarb wonderfully. On another endeaver to Yum! for breakfast, I skipped the pastries and coffee this time and went for the sausage burrito shown above. The portions where more than enough and it was a perfect ratio of potatoes to sausage. 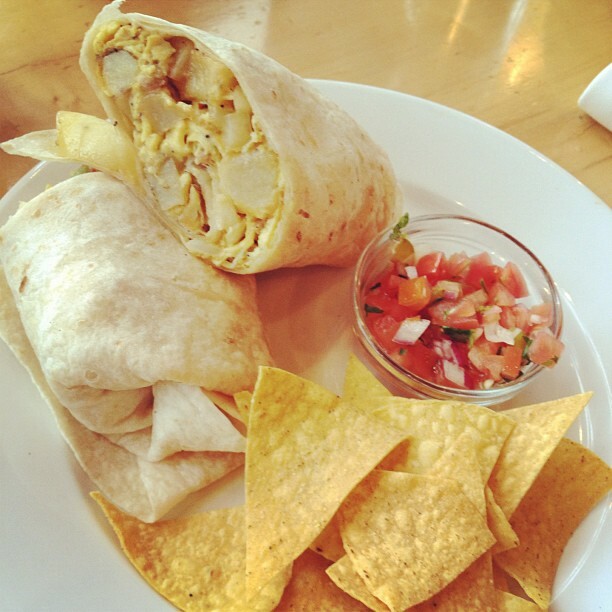 All I can say is that it was one of the best breakfast burritos I’ve ever had. If you are in the mood for great breakfast options (most of them involving eggs) check out Yum! Kitchen and Bakery. More images and reviews from Yum! to come. Located in the south Minneapolis neighborhood, Victor’s 1959 Cafe opened in April of 1999 bringing their neighbors a whole lot of Cuban flavor. Back then, they started as a breakfast and lunch only kind of place. Now, after the reconstruction of their kitchen, they are able to serve their customers a dinner menu in addition to breakfast and lunch. Victor’s 1959 Cafe was visited by the Food Network not once, but twice and was featured on their popular show Diner’s, Drive-ins and Dives. Before my fiancé and I moved to the cities, we took a weekend trip to the Twin Cities metro area and, like all vacationers; we wanted to find unique places to grab a bite…or two. That’s when we stumbled on Victor’s 1959 Cafe. Seeing that both of us adore ethnic cuisine, we were sold on trying a Cuban breakfast. Walking up to Victor’s we were a little surprised to see how compact the restaurant was. Despite its small size, the staff can comfortably fit a sizable crowd. Since there were only two of us, we were seated immediately. For a larger crowd, I would suggest getting there early because Victor’s tends to get a little busy once 10 am rolls around. The staff was great and upbeat! Now, on to the breakfasts we had! My fiancé had a sweet tooth that morning and decided to with the mango waffles. Wanting to try as many things as I could, he was more than willing to let me have a bite of his waffles. Was I ever blown away. The waffles were cooked to perfection, not too crunchy and not soggy either. 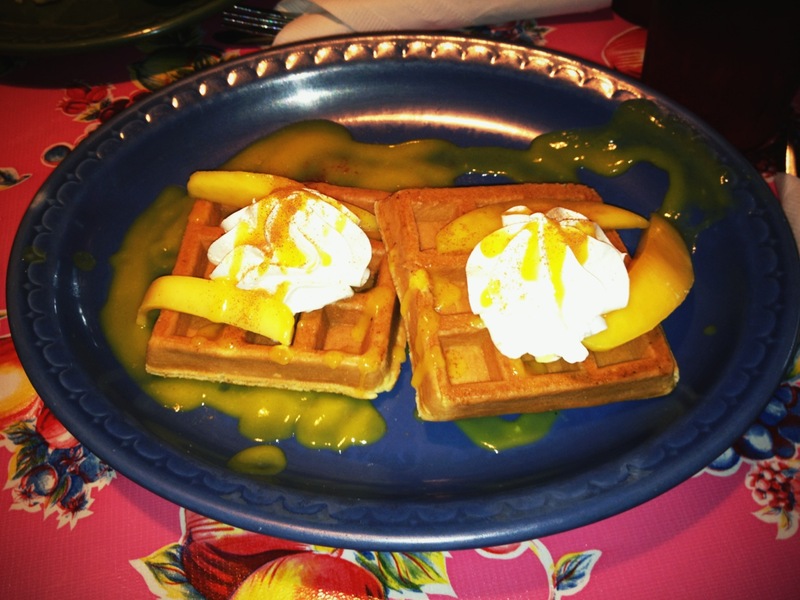 Surprisingly, the mangoes and the waffles went together well and topped with whipped cream made them delightful! Both of us would highly recommend this to anyone dining for breakfast. Now when I go for breakfast, nothing can satisfy my appetite better than a plate of something with eggs. 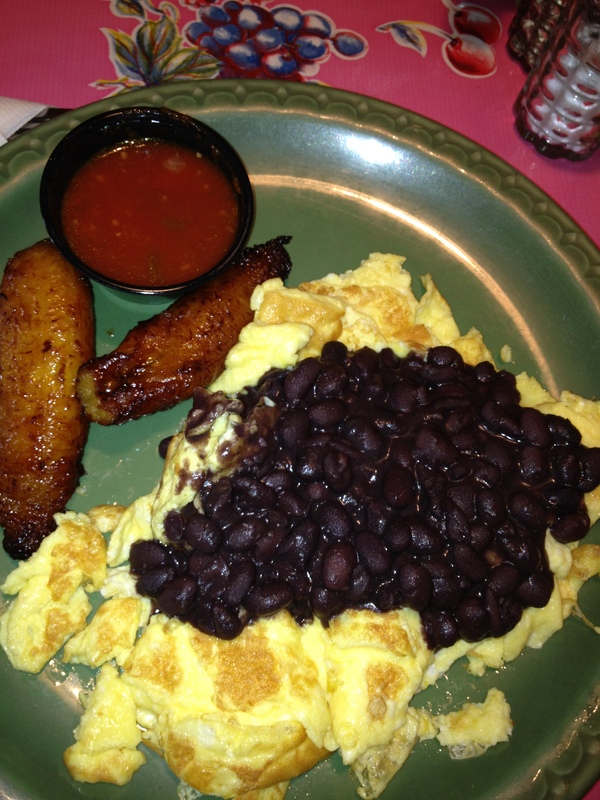 I decided to have the Cuban Sampler, which included eggs with creole sauce, black beans and sweet plantains. All I can say is that this was exactly what I was looking for in a breakfast. Plenty of food with a whole lotta flavor! The dish was served with two corn tortillas, which came in handy for making my own mini breakfast burritos. My meal was filling, but I managed to save room for the plantains. They were a sweet ending to a wonderful morning starter. I encourage anyone looking for a unique experience to check out Victor’s 1959 Cafe. Its friendly atmosphere, great staff and incredible dishes makes this a must stop in Minneapolis. P.S. Bring along some sharpies. The owners actually encourage customers to draw on the walls and leave their mark!